Very few staff at Notting Hill wear anything other than modern contemporary clothes for their work. We don’t have uniforms or a dress code. But when it comes to dressing up for parties our teams really like to push the boat out. 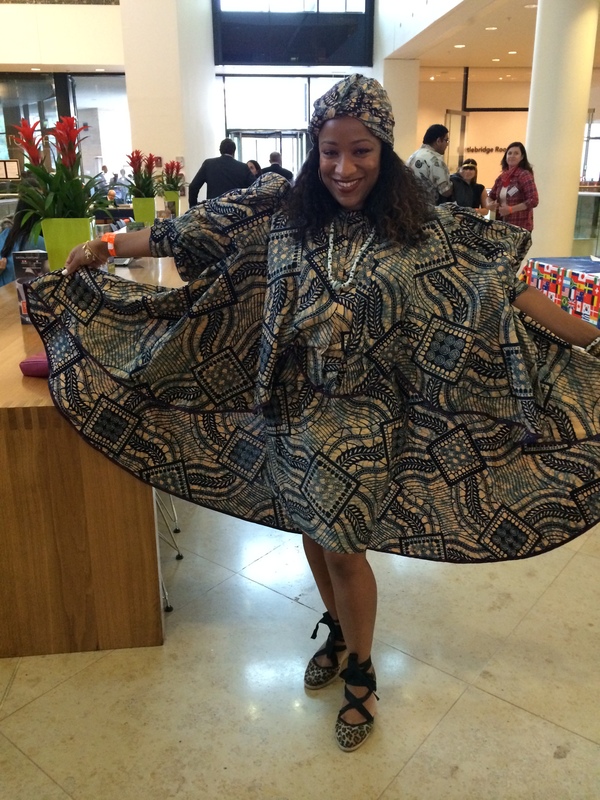 Here is a selection of African fashions they were proudly wearing last week. Sherefe Jemal works at our Extra Care scheme at Penfold Street. She is originally from Ethiopia, and we have talked about the food a few times. There is an Ethiopian restaurant in Kings Cross so I can enjoy injera for lunch, if I fancy one. But this was my first experience of Ethiopian dress. I enjoyed looking at the weave, the strong contrast between red, orange, yellow and black, set off against snowy white. The unique head dress, necklace, earrings and bracelet is beaded in similar Ethiopian colours and symbols and perfectly complement the dress. I have since had a look at Ethiopian styles on the internet, but would love to visit the country one day. 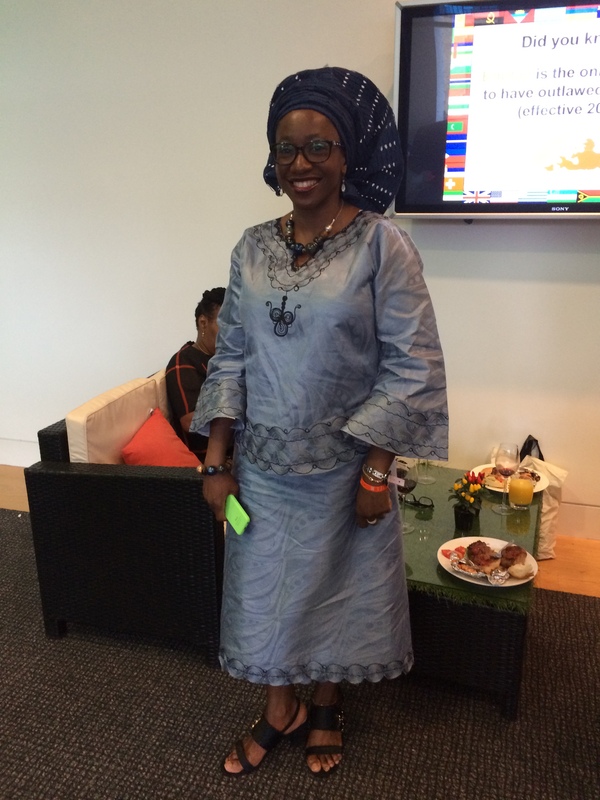 Here is Sumbo Adedeji from Notting Hill Pathways, wearing a lovely Nigerian dress. I love the subtle grey of this outfit – her neon mobile looks somewhat out of place – and the subdued tones of the outfit. This makes it look very modern and fashionable. Sumbo has put together a great outfit, wearing black sandals, beads and bracelet and two deep blue fabrics on her head – a plain one and a tie dye one. Her striking modern spectacles really set this off. I love Audrey Vanderpuye, Property Management Officer, in this dress from Ghana, made with the famous “Dutch Wax print” fabrics that can be seen stacked up in Accra’s Makola Market. They can also be found in Brixton and many other parts of London. Here the traditional fabrics have been made up in an international style – a long, fitted dress. The insertion of lace into the bodice and the bias bound arm-holes provides a nice deep red frame for Audrey’s beautiful face, topped off with a big lace flower brooch. 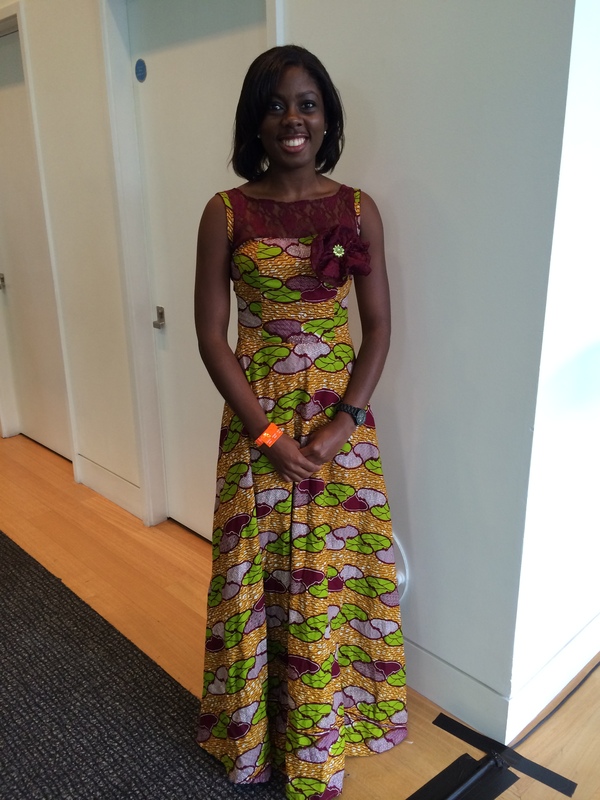 This is an African dress at its exuberant best, made for her mother and modelled by Betty Margai, a Housing Officer. Although the dress is short it has so much drama in its draped sides, its voluminous sleeves and ingenious design (it is tied around the body). Betty who makes alot of her own clothes has arranged a neat head-wrap to coordinate and I love the leopard espadrilles – making it a modern and stylish outfit. Again by choosing somewhat neutral shades – deep indigo and beige – the dress looks contemporary and suitable for a British weather. One way to tell a Nigerian from a Ghanian outfit is the head wrap. Can you see how large and showy these are? The Yoruba women’s “gele” are made from stiff damask type fabrics, pinked at the edges, and the idea is to get it stand away from the head. I think they look sensational, and have the same effect as wearing a big hat. Lots of drama, drawing attention to the face and giving the wearer a real sense of status. Here is Emmanuel Njoku-Ama, one of our accountants, wearing a traditional outfit consisting of a full length wrap, topped with a knee length shirt. The beads, hat and walking stick are very much part of the outfit. The bright turquoise and orange work so beautifully with his deep colouring and the hat and stick ensure the outfit is very masculine and grounded despite the gorgeous, ornate, textured fabrics that make it up. Simply stunning. Isn’t this just such a sweet, elegant outfit on Oluremi Alli? I love the way the bold green print (light, bright, deep and cool) works on this outfit, complementing Remi’s deep skin and eyes wonderfully. But it is the proportions that work especially well. The shape is almost an inverted triangle with the greatest width at the shoulders, topped by a large headdress. The ruffles on the shoulders, the sweatheart neckline and the gele all serve to focus us in on her beautiful, confident but slightly reticent face. She has carefully chosen lovely silver jewellry too, which reflects light and keeps our focus on her face. But as our gaze moves across the circles and ruffles we see the slimmest hips and the most elegant bearing, complemented by silvery, pointed shoes. This outfit is an absolute delight. Wow. What can I say other than I like all of these! Interesting to read about the origins of the different garments. I learned something new about the head wraps. wow, what a party I just love it! fun fun fun! Stunning beautiful outfits!! my fav. is the last green one on Oluremi……ouiiieee BEAUTIFUL. Emmanual ———— fantastic outfit! They are all very lovely …. I can hardly imagine them in contemporary wear as they look so comfortable and at home in their outfits. Awesome!